Crop circles try to relay complex concepts with simplicity, and thus often show their relationship to each other by simple symbols so the complexity can be comprehended. We have stated recently that Magnetic Trimesters exist, a fact that can be determined from the HAARP documentation, and that crop circles with a distinct pattern of three curved arms, such as Beacon Hill and Ohio below, relate to these trimesters. 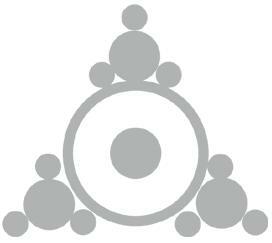 Both these circles above are showing their relationship to another symbol, the evenly spaced balls around the outside of a circle, something occurring in syncopation to the magnetic sweeping arms. Thus, when this same pattern of three balls evenly spaced around a larger ball appears, shown recently in Falmer below, the syncopation relationship to magnetic trimesters is inferred. What is also inferred is that this syncopation of three is repeated, outward, from the Sun, a resonance during the trimesters. In that a year ago in California two balls were shown in the trisection points, and in Ohio just four months later this same two ball formation is shown leading into a dumbbell formation, a progression is shown. California implies that the balanced trimester resonance is normal, but Planet X, coming in from beneath the Sun, forces a distortion in the resonance. Ohio shows that this disruption is caused by the angle of approach, not directly under the S Pole of the Sun but approaching at an angle. This angle also creates a distorted resonance within Planet X. 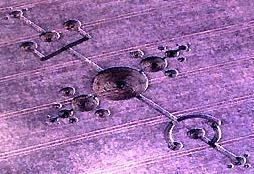 A common symbol in crop circles is also the timeline, a series of steps along a line. 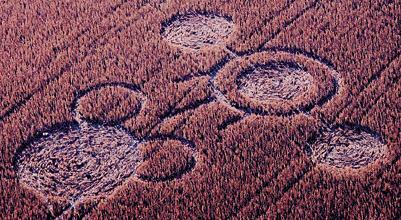 In the recent Hertfordshire crop circle the pole shift is shown to be related to magnetism. During the approach the normal resonating trisections around Planet X are distorted into two dumbbells due to the closeness of the Sun. The closeness of Planet X distorts the resonance the Sun emits outward, represented in the midsection of the crop circle, into a distorted resonance. But as Planet X passes the Sun, moving from the S Pole to align with the Sun's magnetism and exiting on the N Pole side, a dramatic change in the polarity and position of Planet X as it leaves the solar system sets this back to the normal resonance configuration. It also, during this transition, creates a 90° crustal shift in the Earth. This is not simply the Earth adjusting to the passage of a large magnet, Planet X. It is that both Planet X and Earth are in a maelstrom of magnetic particle flows, distorted, and eager to establish the usual balance. Both mere flotsam, in the magnetic sea.